Many Children are baptized into the Catholic Church as an infant. Through Baptism they are freed from sin, become members of Christ and incorporated into the Church. Baptism gives access to other sacraments. Sacramental Preparation classes allows these children to come into full union with the Catholic Church. It is a two year program for the preparation of the sacraments of the Eucharist and Reconciliation. The Sacramental Preparation classes are open to all baptized Catholics in grades 3 – 12 who have not completed the Sacrament of Reconciliation and/or the Sacrament of the Eucharist. Classes are held each week in the Parish Life Center. 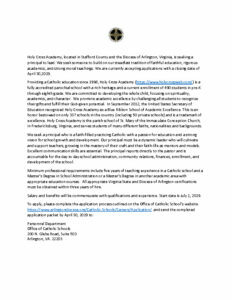 To register for Confirmation classes, contact the Religious Education Office at 540-373-6491.